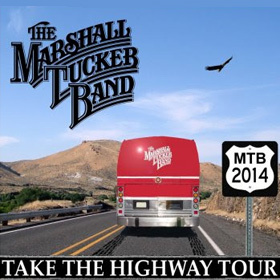 The Marshall Tucker Band kicks off its 43rd year on the road with the announcement of its 2014 Take The Highway Tour. With nearly 40 concert dates revealed, the band’s first stop is Honolulu, Hawaii. A full list of dates is below, with additional dates added in the coming weeks. Founded in Spartanburg, S.C., the 3x platinum-selling southern rock group has sold more than 15 million albums to date. The band’s songs have also been featured with sync placements, including Blow, The Box, Swing Vote, Half Nelson, Breaking Bad, My Name Is Earl, Cold Case and Good Guys. For additional information, visit www.marshalltuckerband.com.